We are so sad to announce that we lost a dear friend last week. Raven, our three year old Thoroughbred filly, was humanely euthanized on Wednesday after a bad colic. 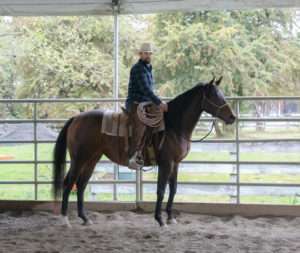 We love all of the horses that pass through SAFE, but every so often, a horse comes along that works their way into the hearts of most everyone they meet. Raven was that horse. Her loss has been unbearably sad for the volunteers and staff here at the barn. Our Raven was a stunningly beautiful horse: tall, athletic, and high spirited. She was so vibrant and full of life that it was easy to forget what a hard beginning she had. 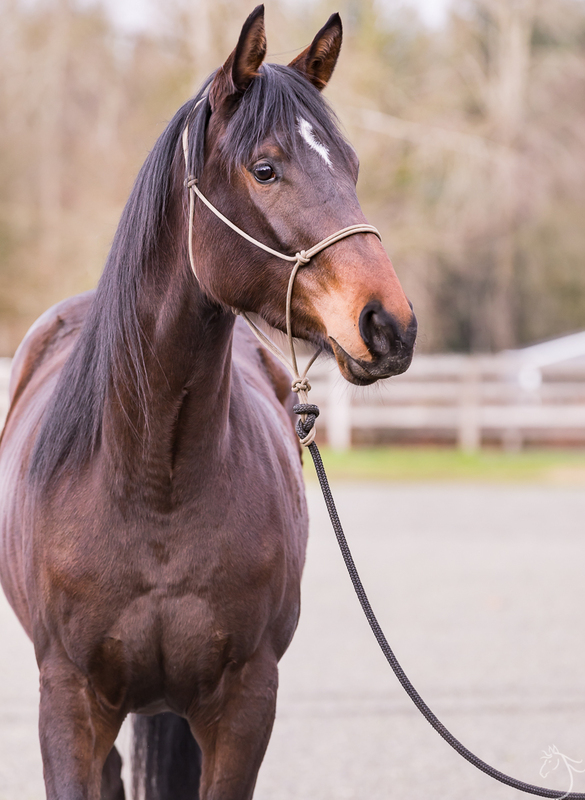 As a young horse, Raven was seized by Animal Control along with her dam. 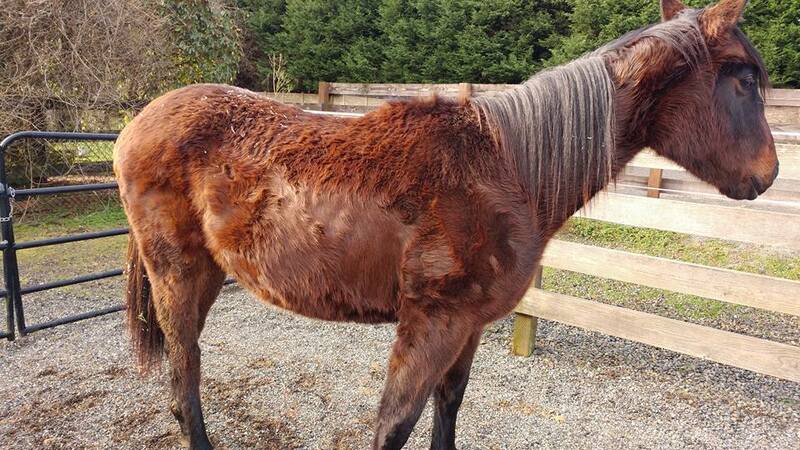 Both horses were starved and badly neglected, with painful hooves and protruding ribs and hip bones. Sadly, help had arrived too late for Raven’s mother. Not long after they were removed from their owner, she was found down and unable to stand. Vets determined that there was nothing that could be done for her, and she was humanely euthanized. Raven’s chances for survival seemed bleak as well. She had two serious bouts of colic while in county custody, and both times was treated by the vets at Pilchuck Vet Hospital. This was especially difficult for her because she’d had very little human contact up until this point, and found people to be quite strange and scary. But she was smart enough to accept the help and care being offered to her, and soon the Pilchuck staff nicknamed her “Sweet Pea,” a testament to how brave she was. Raven was released to SAFE after she was discharged from the hospital. She was a pathetic little thing, sad and scruffy looking, and covered in rain rot. This necessitated even more human contact for her, and it was not long before she decided that we were okay. From that point on, she was a friendly, curious, and interactive horse. Though she never set foot on a race track, Raven possessed a lot of the personality traits that we typically see in off‐the‐track Thoroughbreds. She was exceptionally playful, and the more noise her toys made, the better. The most social horse in the barn, she insisted on greeting everyone who came into the barn and demanded as much attention as possible. And in her paddock, she entertained herself by digging enormous holes. We’d fill them in, she’d dig them back out again. She seemed to love making people laugh, and she definitely loved being scratched and petted as much as possible. But there was something not right inside Raven. We’ll never know if it was caused the neglect she suffered at a young age, but her digestive system could never seem to keep pace with her spirit. She had frequent colics. Most were short‐lived and passed relatively quickly but sometimes she was uncomfortable for longer periods of time. She was seen by vets from Rainland Farm and Pilchuck and tested for every digestive condition we could think of, to no avail. The only way we found to minimize her symptoms was through control of her diet. Again we tried numerous combinations of feeding for her: different hays, no hay, no grain, only grain, only pellets.…Raven would do well on a particular diet or medication for a period of time, but the colics would return. This past May, Raven went to Pilchuck for an extensive diagnostic workup with internal medicine specialist, Dr Wendy Mollat. She was given a full abdominal ultrasound, which only revealed one abnormality: the location of Raven’s spleen. Was this the cause of her colics? It was hard to say. But our friends at Pilchuck came through with an incredible solution to Raven’s feeding woes. They donated an iFeed automatic horse feeder to us, a device that could be set to dispense small meals to Raven in her stall all through the night. 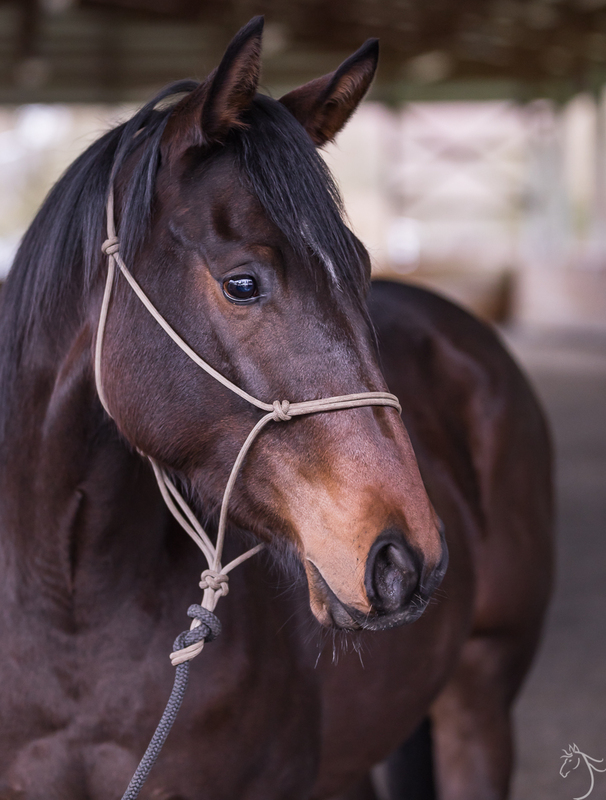 The idea being that keeping her eating more or less constantly throughout the night would help neutralize stomach acid and more closely mimic the natural grazing behavior of horses. She would also receive timed feedings of grain while outside in her paddock during the day. This system provided the best results for Raven, and allowed us to add one more thing to her routing: grazing. At the beginning of summer, we started the long process of getting Raven acclimated to eating fresh grass. She started with 5 minutes on grass, no more, no less. This was increased to 10 minutes, then 15 minutes, and so on…an extra 5 minutes longer on grass each day. We watched her carefully…no sign of colic. Soon she was spending an hour every morning on the grass…then two hours…until finally she was out on grass for half the day, every day. This was when Raven really took flight. Nearly every morning, before taking even a bite of grass, she would run…and run..and run. She would buck and fart and leap into the air. In these moments, she was pure beauty, pure joy. And everyone would stop what they were doing to watch her, to take in the beauty of her movement as she pounded the earth and flew through the air. It was magical. Every single day, it was magical. She could be a real horse. We had a wonderful summer with no colics. 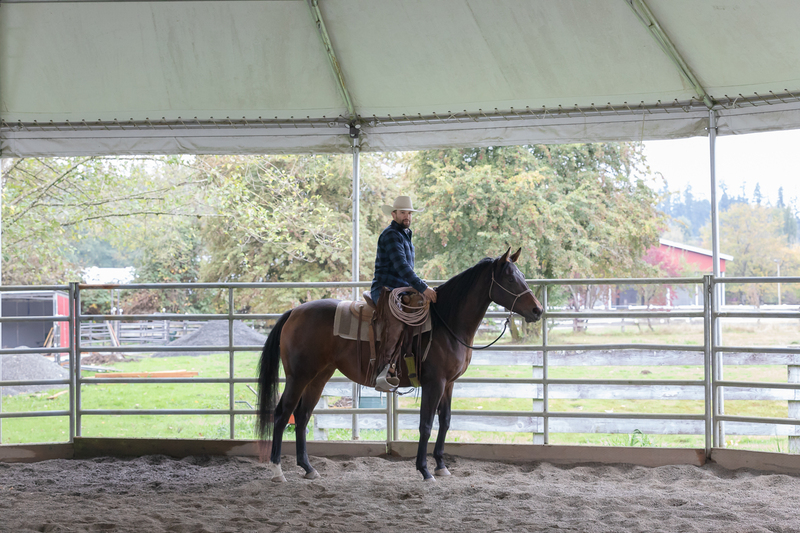 Raven was put back into the Horsemanship program to start ground work in preparation for being saddled. Not a moment too soon, because this horse had grown up big and energetic, and she could be rather full of herself! Some days she was an angel, and some days she would challenge her handlers. Some days it was as if all of the life and spirit inside was ready to come bursting out! But throughout it all, she was a good girl, with a lot of try, who really wanted to please. It was a huge moment for all of us when we watched Joel Conner saddle her up and climb aboard for her first rides. She was a superstar. She was ready to become a riding horse, and someday have a home and a person all her own. But it was not to be. Last Tuesday, she seemed off when she was brought in for the evening. The evening crew noticed that she wasn’t eating, and we realized that she was colicking. Dr Lewis from Rainland was called out to see her, and she was tubed with fluids and given banamine to make her more comfortable. But she continued to act agitated…lying down in her stall, getting up, going back down. When these symptoms did not get better, Dr Lewis was called out a second time. Raven was very sick, and she was hurting. Dr Lewis advised us that the best course of action was to transport her to Pilchuck, where she could be put on IV fluids and monitored throughout the night. So at 2:30am, we hooked up the trailer and drove our girl to Pilchuck. Thankfully, the veterinarian on call that night was Raven’s good friend Dr Mollat. Dr Mollat started by doing an ultrasound, and what that revealed was not good. Several loops of Raven’s small intestine were dilated, and nothing was moving through her system. The fluids she had been given earlier in the evening remained in her stomach. She was tubed again to drain the liquids in her stomach and hopefully make her more comfortable. But because she wasn’t digesting the water in her stomach, she was becoming dehydrated, so she was put on IV fluids overnight as well as medication to manage her pain. We left Pilchuck at 5:30am and went home to pray for a miracle. Unfortunately by morning she was showing no signs of improvement. Another ultrasound had revealed more dilation in her small intestine. She was still in pain. The next step would have been exploratory surgery…but Dr Mollat did not feel that Raven’s issues would be resolved with surgery. It was not the right choice for her. There was nothing more that we could do. So we made the very difficult decision to let her go. Saying goodbye to any horse is painful. To say goodbye to one so young is devastating. But it was the right choice to make. We loved her too much to let her be in pain. And as hard as it was to let her go, we knew that we couldn’t let her face another colic like the one she was battling. There comes a point at which you have to face the hard reality that you’ve tried everything but some things are just not possible. But what we could do was ensure that she would never feel this pain again. So we let her go. She passed peacefully, surrounded by people who loved her. Here at SAFE, we’ve been struggling to deal with this tremendous loss. We take comfort in knowing that we did everything we could possibly do to give her a good life. She had a lovely wonderful summer in which she got to run on the grass every single morning, and live life like a normal horse. Without the careful and loving care she received at SAFE, she might not have had that time. We only had a short time with her, but the time that we had was precious and wonderful. She flies free now, and she lives on in the hearts of everyone who loved her. My deepest condolences to you all. Sending love, and appreciation that you gave sweet Raven such good care for the short time she had in this life. What a sad story for both Raven and her mother. The neglect of animals is so heartbreaking…it often debilitates me.…Thank you so much for all you do, it is truly amazing. I am so sorry. This is heartbreaking even knowing you did all you could, and gave her a true horse life for as long as possible. Peace and love to all of you, especially Raven. Horses steal our hearts long before they leave us. My gratitude for the work you do every day to offer horses who may never have experienced freedom, food, comfort, care and tenderness, the gift of each. I’m so sorry for your loss. God bless you for the love and TLC you gave her. One good summer is more than many of these sweet animals get. I will never be able to wrap my brain around how any human being can neglect and abuse any innocent and totally dependent animal. Tears of sadness for Raven and all who love and miss her. Sometimes the most we can do is show a horse love, fun and good care for the last part of their life and their passing. What a gift that must have been for Raven. She died knowing she was loved and was able to run and kick and be a horse. ‘Good On Ya’ to all of you.